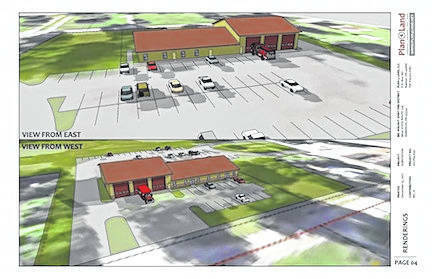 The drawing shows plans for new Big Walnut fire house in Chesterville. CHESTERVILLE — On Nov. 14, the Big Walnut Joint Fire District and Highland Local School Board members finalized and signed a land purchase agreement for the property located at the old Highland North Elementary building. Superintendent Daniel Freund donated $1 to the school board for the purchase of the land. BWJFD plans to build a new firehouse to replace the 100-year-old building they are currently operating out of at 26 S. Portland St. Currently, BWJFD operates out of 2 stations in Marengo and Chesterville covering the townships of Harmony, Chester and Bennington including 12 miles of I-71. At present, the firehouse in Chesterville is only big enough to house a single fire engine. The need for a bigger facility, more personnel and equipment are at the forefront of concern with the growth and development coming in at the interchanges within the district, said Rocki Huddleston, BWJFD public information coordinator. “We would like to thank our citizens for their continued support and we are proud to serve you,” Huddleston said. To keep up to date with the progress of the new fire station and Big Walnut Joint Fire District, follow them on Facebook, Twitter, Instagram and at www.bwjfd.org.